There was no choice but to wait the storm out. Night came quick on the Tambopata River, aided by the dark grey clouds producing the torrential rains pouring down on us. Branches, logs, and entire trees could be seen floating atop the water's surface, the result of flooding and erosion further upstream. Flashes of lightning illuminated the world around us, a foreign world of thick jungle, jaguars, howler monkeys, and chicken tarantulas the size of a human hand. 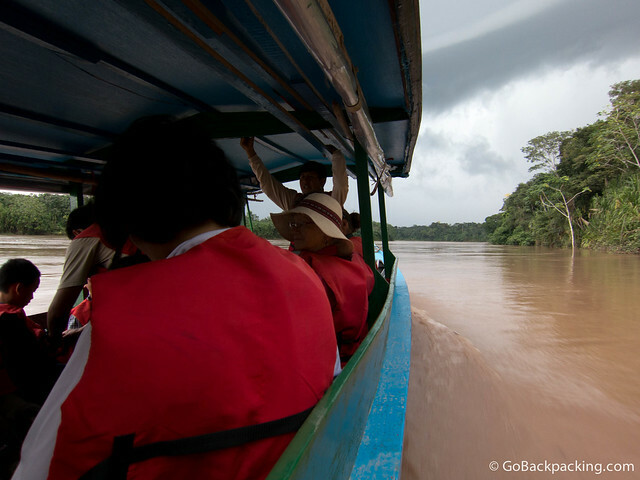 My first boat ride into the Peruvian Amazon had thus far been anything but routine. That we were tethered to a tree, in the pitch black, with no idea where we were, was par for the course. The adventure began earlier that morning, when I boarded a spectacularly scenic Star Peru flight from Lima to Puerto Maldonado, via Cusco. Though short in duration, the flight cuts directly across Peru, from the urban sprawl of Lima and the drab desert surrounding it, to the snow-capped mountains and glacial lakes of the Andes Mountains, and ultimately, the thick green jungle of the Amazon Basin. To disembark in Puerto Maldonado, is to feel as though one is stepping directly into a sauna. The humidity ensures you immediately begin sweating. 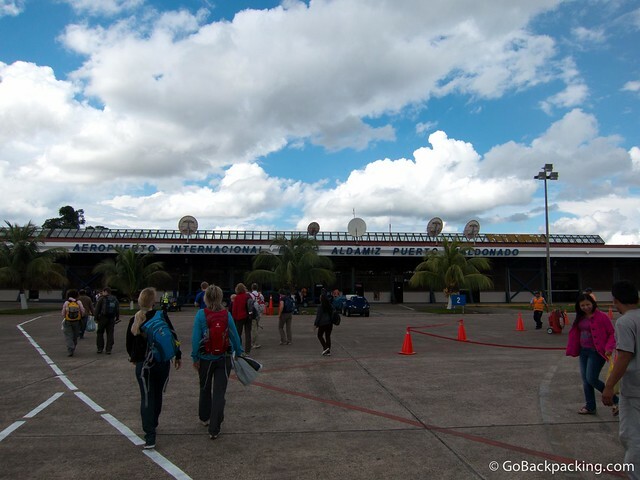 Inside the terminal, while waiting for the bags to arrive, a representative from Rainforest Expeditions found me, as well as several families who'd arrived on the same flight. I was introduced to Pedro, my guide. 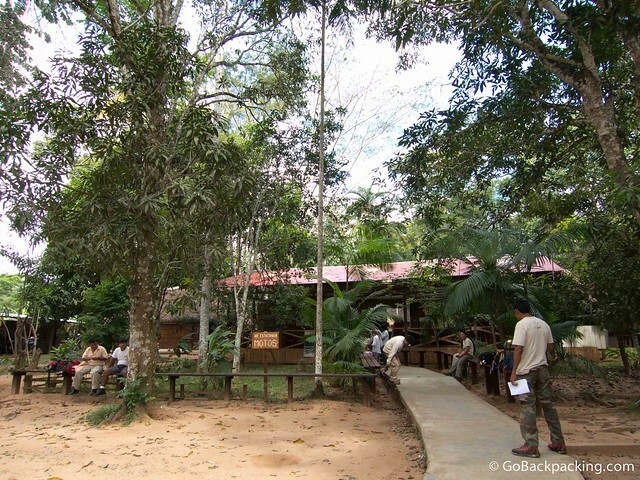 Tours to the Tambopata Research Center benefit from a 6:1 ratio of visitors to guides. The small groups allow more interaction, as well as improving the odds of spotting wildlife during the walks. We boarded a comfortable shuttle bus, which drove us the ten minutes to the company's nearby headquarters. We were greeted with a glass of juice, and informed of another flight which had guests, and was running late. An hour later, a third family arrived, and we re-boarded the shuttle bus again for the one hour ride to the Tambopata River. There were three families, including seven small children, and one pair of grandparents. I was surprised to learn these Amazon trips are popular with families, especially ones with little children. 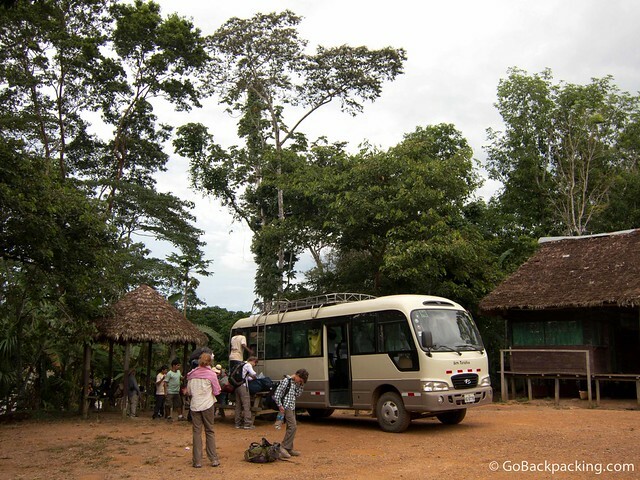 The bus ride to the Tambopata River is along a dirt road, with several unfinished bridges. The large, orange-painted steel beams appeared to be a big improvement over the tree trunks we were using to cross streams. 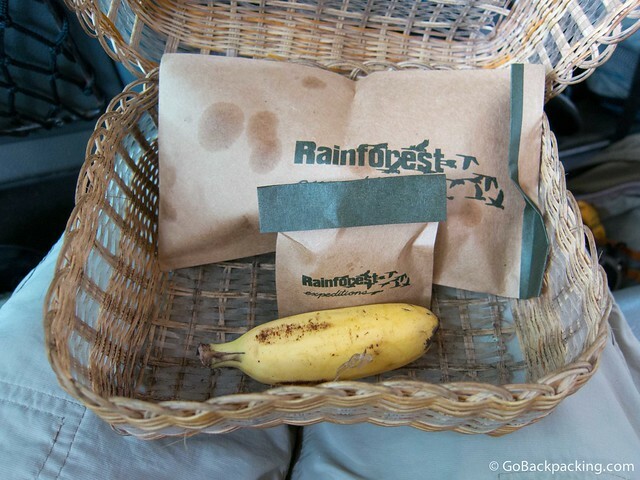 Along the way, we nibbled on snacks provided by the company, including bananas, banana chips, and Brazil nuts, which are harvested locally. 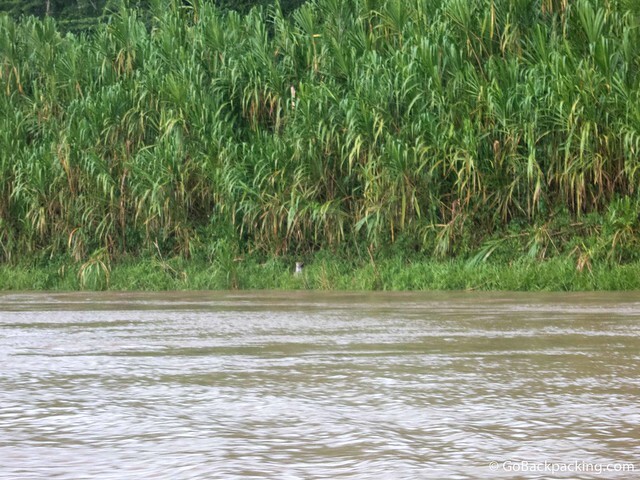 Once we reached the river's edge, there was the opportunity to use the restroom, as it was going to be at least a two and a half hour ride upriver to reach Refugio Amazonas, where we would be spending the night. It was about 3 PM, and the skies were decidedly overcast. If the rainforest is anything like the mountains, the later in the day it gets, the more likely you'll have rain. I could tell from looking at the clouds, it wouldn't be long before they let loose. Within 15 minutes of boarding the narrow, blue wooden boat, we cruised right into a thunderstorm. Semi-clear plastic tarps were dropped down from the sides of the boat. The driver prefers not to use these as it severely limits his vision, however if the rain and wind are strong enough, they're used to ensure guests and their luggage don't get soaked. A lunch of fried rice with chicken, wrapped in a banana leaf, was handed out, along with bottled water. The rice was excellent, and a positive indication of how well they'd feed us at the two lodges. The rain began to let up after twenty minutes, and the tarps were rolled up so the driver could see better, and we could look for wildlife in the jungle. Kurt, one of the co-founders of the Tambopata Research Center, previously told me the best chance to spot a jaguar was on the boat rides. And the more time you spent on the river, the better your odds. I was so preoccupied with trying to process everything that was happening, I hadn't thought to keep an eye out along the river banks. The Tambopata National Reserve is filled with wildlife, from a dizzying number of birds, to five kinds of primates, caiman, and piranha. But the jaguar is one of the most elusive, in part because the density of vegetation limits visibility, and cats are nocturnal. An apex predator, it stands proudly atop the local food chain. And I wanted nothing more than to see one in the wild during my 6-day trip. One hour into our boat ride, as we were cruising along the left bank of the Tambopata River, we came right upon a jaguar, sitting and watching the world go by. Several kids were looking out that side of the boat as we passed it, and a cacophony of shouts soon broke out. Despite the commotion, the jaguar remained seated. We were no more than 20 meters from the shore, and the mental picture I snapped at that moment, of this beautiful, spotted creature, will be one I never forget. The boat driver immediately swung us toward the center of the river, so we could reposition ourselves for another look. As this was happening, the jaguar slowly repositioned itself as well. By the time we were close to the shore again, the jaguar was barely visible. One of the guides indicated it was still close to the shore, only a few meters within the vegetation ensured it was practically invisible. I found it interesting how calmly the cat acted. It didn't immediately run away when everyone on our boat began yelling “jaguar” and pointing, nor did it leave the scene entirely when we returned for a second look. Instead, perhaps because it was curious, or ready to protect its territory, it laid in wait, watching and waiting. When it was clear the leopard wasn't coming out, we continued on our way upriver. Barely an hour into the tour, and I'd already experienced what I knew to be my #1 highlight. 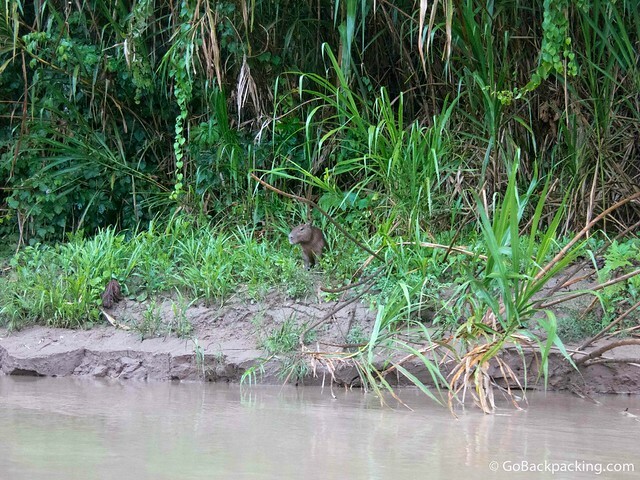 Further along, we came across capybara feeding on vegetation at the river's edge. The capybara is the world's largest rodent, with adults weighing 77 to 150 lbs (35 to 66 kg). They are found throughout much of South America. Being that I already saw a jaguar, it was now my hope to see a jaguar hunt and kill a capybara. On safari in Africa, I quickly learned that seeing large cats hunt and kill prey was a much more sought after experience than simply watching them lounge under a shade tree. Thirty minutes from reaching the Amazonas Lodge, around 5:30 PM, another thunderstorm erupted. This time, there was little daylight left to aid the boat driver in navigating the river. We witnessed entire trees floating downstream. Combined with the wind from the storm, the conditions had become dangerous. A decision was made to tie the boat up along the riverside, and wait out the storm. Several of the guides made this happen, and we soon found ourselves sitting in the dark, on a boat, in the Amazon. Thunder cracked all around us, and lightning gave us momentary glimpses of the river and jungle around us. Surprisingly, most of the kids seemed perfectly fine with the situation, as did their parents. I began listening to music on my MP3 player, and hoped the storm would let up sooner rather than later. Our delay amounted to forty-five minutes. Once we untied from the tree and began motoring up the river again, it was at a much slower pace. Pedro was standing at the front of the boat, holding a search light up to help the boat driver avoid the debris which continued to float along the water's surface. To the driver's credit, we arrived safely, as the rain was letting up. By the time we walked the ten minutes up to the lodge, our way lit by headlamps and flashlights, dinner was being served. Our bags were brought up to the lodge for us, and we were then shown to our rooms. 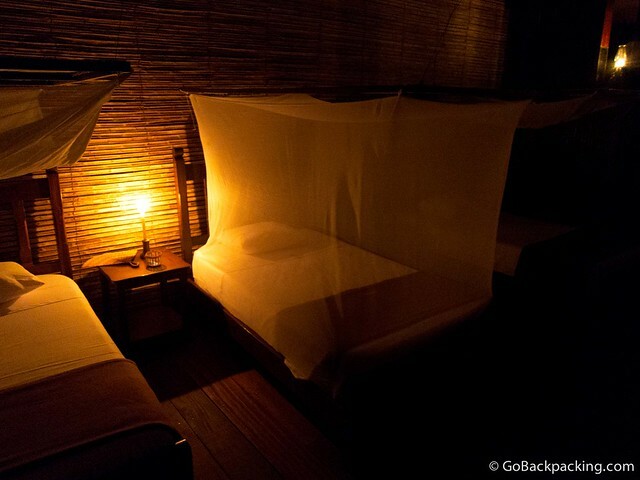 A mosquito net had already been pulled down for me in the room where I spent the night. Light is provided by candles on the night stands, and kerosene lamps in the hallways. The amenities were all more comfortable than I'd expected. After grabbing dinner, and catching up with Lainie and Miro, who'd arrived a day before me, I was ready to retire. The next day, we'd be back on the boat, heading even deeper into the Amazon. So amazing that you saw a jaguar! I couldn’t believe it, and within the first hour! A few days later, when we were at the Tambopata Research Center 8 hours upriver, a group saw a jaguar (possibly hunting) while they were doing a nature walk, about 10 minutes from the lodge, in the late afternoon. I saw a jaguar cub once in Guatemala. Someone I knew bought it from a hunter for $50. Haha, not quite the same experience. What did your friend do with the jaguar cub? That is amazing you saw a jaguar on the boat ride in. 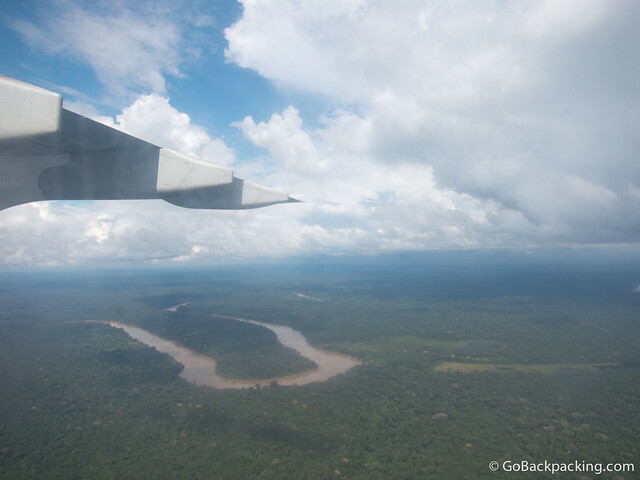 This blog is going to make a lot of people want to check out the Tambopata River in Peru. Amazing, isn’t it? Their was an older couple, grandparents, on board. Each of them had been to Tambopata twice before, and they’d seen jaguars each time. Of course a lot of luck is still involved, but going on boat rides is a lot easier than trying to track them on foot in the jungle! WOW – you spotted a jaguar!! That’s an incredibly rare and fortunate experience! Hey Cam, yea I know! Plus, we saw it after only an hour or so on the river. A few days later, some visitors spotted one on land during an afternoon nature walk. Tambopata National Reserve is a great spot for jaguars, apparently.